Last Saturday we had breakfast with an educator who has a powerful position in a major foundation. Part of his work includes developing teams to change curriculum. We talked about how hard change is and how important a supportive cohort therefore becomes. She may have meant it as a compliment, but I recognized the downfall of that approach when a colleague working on her administrative certificate used my class and me for a case study. Recording detailed observations allowed her to quantify the teacher talk. Even in the early 80s, despite my teacher training that focused on students as “buckets to be filled,” I talked too much. “But how do I do that?” I really didn’t know. I don’t remember what suggestions she may have offered then, but when my visionary department chair introduced our department to problem-based learning, I finally understood. PBL gives students more ownership of their learning, creating situations in which they usst construct and evaluate their understandings. Constructivism made learning more compelling and teaching more exciting – if also more challenging. PBL provided a meaningful structure for that shift from teacher talk to student ownership. I began to seek ways to make even traditional literature study more student-centered. 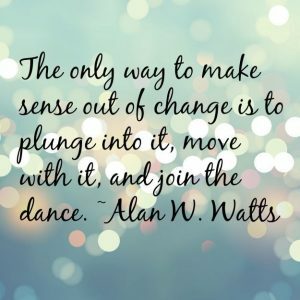 Changing my ways did not come easily, though. I stumbled through my first training on coaching, at a loss, nearly ready to give up. Continued training experiences and a connected community kept me going. Too much of a “lone ranger” in my own building, I depended on conversations with my department chair and emails with colleagues from the frequent workshops I took. The next year for Back-to-School Night, I invited my students to describe their work in the classroom, leaving the room while they did so that parents could believe in the authenticity of their words. Students willingly gave up free time to help, so invested were they in this kind of classroom experience. Yet I know I would still be a breathless talker without the support of my peers in shifting my role. That same visionary department chair started a brain research study group. Learning about new findings from neurologists and their potential impact on teaching and learning invited new approaches, and our conversations and sharing of both frustrations and successes made daring those approaches more accessible. It is far easier for teachers to repeat lessons year after year, teaching in the same way, regardless of their student population, than to seek new ways to become more effective. Ongoing support makes such a huge difference. Why, then, so schools and districts too often fail to offer teachers opportunities like learning cohorts? 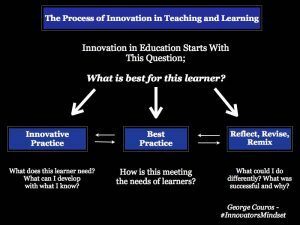 What is true innovation in education? George Couros, educator, blogger, and author of The Innovator’s Mindset, asserts that “innovation is more about mindset than anything.” Educators shouldn’t employ something new just because it is new. We need to ask ourselves where there is value added. Does this tool or approach improve teaching and learning? How can we use it even more effectively? Too often educators conflate technology with innovation. In the early years of computers in the classroom, my department chair and I attended a technology conference. A dedicated teacher demonstrated how her students had created a spreadsheet of information about inventors like Eli Whitney and their inventions. The information was thorough: name, place of birth, type of invention, year invented, etc. A spreadsheet like this could prompt all sorts of analysis: Is there a pattern to where and/or when were most prolific? Do different times and/or places generate different types of inventions? But for this teacher and her students, the spreadsheet was an end in itself. Without using its data-sorting capacity to look for patterns, it served as a glorified graphic organizer. True innovation transforms teaching and learning. The use of computers to teach writing offered me and my students that kind of transformation. While my high school and college papers were handwritten on yellow legal pads filled with cross-outs, arrows, and insertions, my students could save one version of a paper, rename their file, and revise it with ease. Then they could compare the two versions and track their progress. The ease of revision encouraged their willingness to improve their text. Text analysis went far beyond a mere spellcheck capacity when we became the beta site for Bell Labs’ text analysis program, Writer’s Workbench [WWB]. That empowered my students to assess attributes like their sentence variety and use of passive voice. I never reduced their work to an absolute quantitative judgment, but I did require them to justify departures from the benchmarks suggested by the analysis. Good writing generally varies the openings, types, and length of sentences. While neither Faulkner’s nor Hemingway’s writing would have passed muster, students rarely achieved either style. Conscious work on sentence variety improved the flow of their writing. Passive voice provides for weak constructions and often hides an unclear or unknown subject. WWB identified all passive voice constructions, and my writers rewrote those or explained why. In the computer lab with an administrator’s access, I could comment directly on their work in progress, giving them real time feedback long before they turned in a draft for evaluation. Each class could desktop publish an anthology, giving students a communal document of accomplishment that we celebrated with a signing party. Computers transformed the teaching of writing. Math teachers will tell you that calculators transformed the teaching of math. But it’s important to recognize that technology only fosters true innovation in education when it changes the work for the better. Couros is right: if any new approach or tool doesn’t meet the needs of learners better, if we don’t use it to make the experience more productive, then we’re missing the point. And learners deserve better than that!